Restaurant games on iOS tend to follow a certain template. They’re time management titles, all about organizing customers and orders for maximum profits. Sometimes they’re freemium, sometimes not, but they all fall in line, and that line is getting a bit stale. They are certainly not about wildly flinging knives at customers to spear ingredients for their meals in midair. 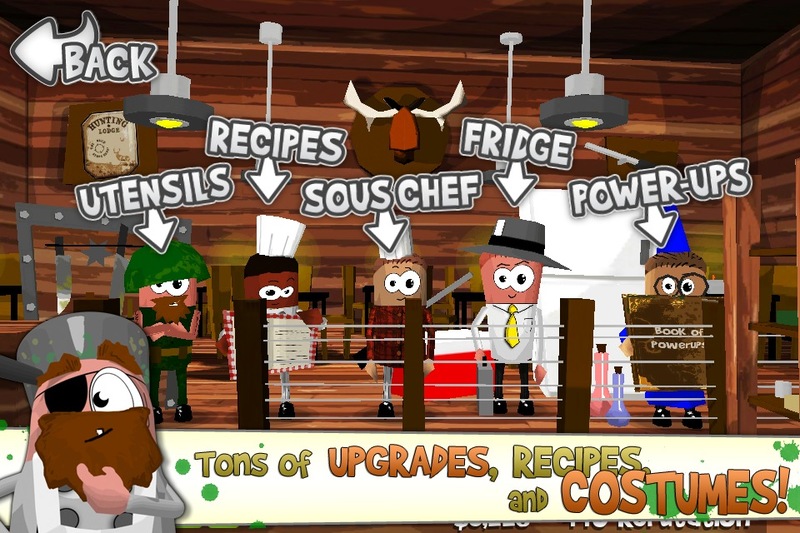 And yet here we find ourselves with Mad Chef [$0.99], a frantic, imaginative take on the restaurant gig from Foursaken Media, the folks behind the outstanding Bug Heroes series. Mad Chef doesn’t quite meet the epic scale of Bug Heroes, being both far more casual and far less strategic, but it exhibits the same thoughtful design and attention to detail we’ve come to expect from Foursaken Media. The game centers around frantic tapping, so you’ll have to get behind that mechanic in a big way. Once you do there’s a boatload of entertaining content to work through. I can’t be sure if this game is going for the stereotype of the slightly unhinged artist, or if you’re intended to be in charge of someone who poses a significant danger to others. As your customers (who hunger for dishes like Pigeon Pot Pie and Ratwurst) line up, your sous chef tosses out a huge assortment of ingredients. Your job is to tap the ingredients needed for each recipe and throw knives at them. If you miss, you stab your customers or sous chef instead. Is this where our craze for creative food carts has gotten us? For the most part, though, your customers are into it. It’s a rough life building your way up in the restaurant scene with nothing but Roach Bran and willpower, but each time you play you make yourself a little more money and hopefully earn a bit more reputation. Once you hit certain reputation milestones, you can open four more restaurants, each quicker and harder to play than the last. That doesn’t mean you’re done with the old ones, though. Managing a culinary empire requires a personal touch. But the more restaurants you have, the more money you earn while you’re away — a mechanic that translates nicely from the freemium market to this premium game. Mad Chef takes another step into freemium-style with purchasable packs of cash and reputation. They’re not necessary, by any means. You can work your way through the game normally, playing at your own pace without ever making a purchase. But the early restaurants are easy, and earning enough rep to open the later, more difficult restaurants takes either a lot of grinding or reasonably large cash investment. I can’t help but feel like the difficulty curve would have been better had Foursaken Media not been planning for an IAP option. Thankfully, this is balanced by an upgrade system that does a great job of making the grind feel a little less grindy. As you earn cash, you can invest it back into your restaurants. You unlock new recipes, an improved sous chef, and more. These improve your returns, and your customers grow more demanding. The food cart, for instance, starts off slow — one order to fill while ingredients meander their way across the screen. By the time you max it out, you’ll be managing four simultaneous orders with an ever-changing list of ingredients, and you’ll also have to watch out for spices that increase the bill. It’s frantic, and each restaurant gets more and more insane by the time you reach their top ends. There’s only one problem with that — the time the knives take to fly to their targets, and the related trouble of hitting overlapping items. The game is generous about awarding you hits for the right item if it can choose between one right and one wrong, but if both options are valid you might end up tossing knives at multiple ingredients only to have the game choose something unexpected, messing up the other knives you have in the air. It’s only an occasional problem, but in a game that rewards perfection it’s a frustrating one. If you want to mix things up a bit, you have options. 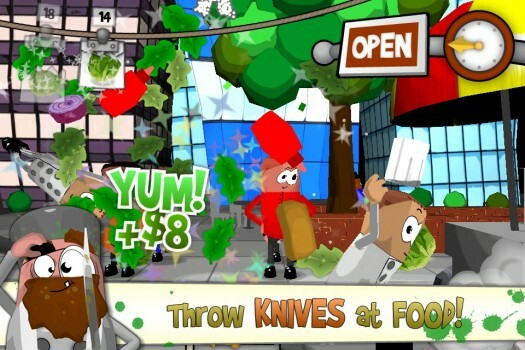 The Take Out restaurant is always available, and it offers an endless mode that has you toss knives at ingredients by category. It’s a good way to earn a little cash in a hurry. Every so often, you’ll also get a rush of customers. For these Rush Hour specials, you can forget about recipes — it’s all about spearing every ingredient that flies across the screen for huge combos, and hoping you don’t end up spearing a customer. 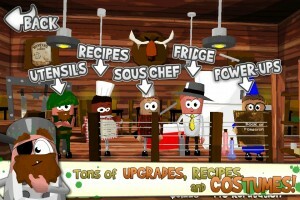 Mad Chef is an immense game, once you settle in and look around a bit. It’s also lovingly crafted. Take a look at the in-game achievement system if you want to see why I say that: the Game Center achievements are presented as awards on the wall of your home, and the more you earn the nicer your digs get. It’s a little, unnecessary touch that makes progressing all that much more rewarding, and that’s reflected in the rest of the game. There is often unexpected charm to be found. In the end Mad Chef lives or dies on the joy of tapping. It does a great job with its simple mechanic, veering away from simple spamming to something that takes a lot of thought and attention. And, you know, crazy-fast tapping. It’s a lot of game for your buck, so check it out. Then swing by our discussion thread to let us know what you think.